UPDATE: (1/4/2017) Books are Now Closed!! 2016 was a great year here at Ryan W. Knives! My books were closed all year in an attempt to catch up on orders that extended for some more than 2 years. For the most part I am all caught up (Sorry to those few still hanging in there)! I am now opening my books again to the public to fill a number of slots then I will close them back up. I plan on keeping the wait less than a year! The sooner you get your order in, the shorter your wait! 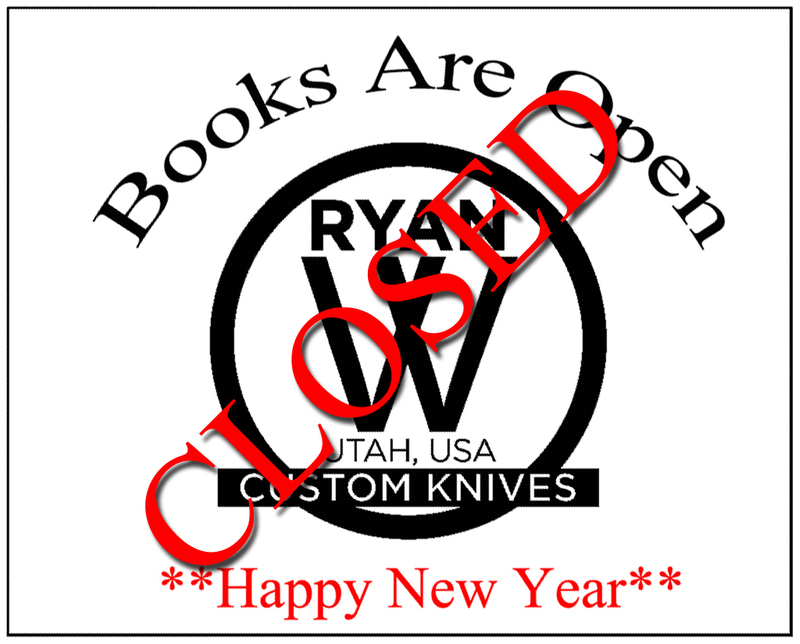 FYI – Once you are a Ryan W. Knives customer my books are always open to you!!! I will require a 10% deposit on all orders… This is deposit is fully refundable! The reason I do this is to keep communication open, in the past I have had people change their minds (Which I totally understand) and then just disappear. Unfortunately I waste a lot of time trying to contact those people to no avail. The deposit helps people respond! Sooooo – Follow this link: Place Your Order Pick your knife and follow the steps… I will be in contact with you via Email! ….. Thanks for making 2016 Great!